Jacquie Stevens, a member of the Hochungra (Winnebago) tribe in Nevada, trained at the Institute of American Indian Art in New Mexico, with renowned Hopi potter Otellie Loloma (Schaaf 1969). There, Stevens developed a style of pottery that seamlessly transcends the Native-Anglo art border. Her works employ traditional Native Southwest techniques such as pit-firing with cow dung and coiling. 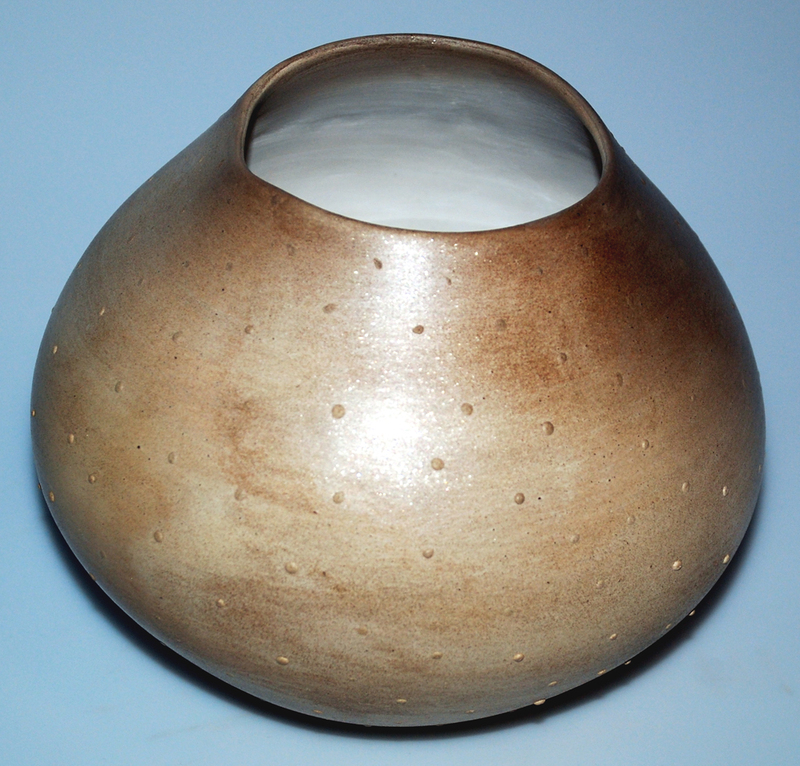 As an artistic innovator however, Jacquie is thought to be the first to coil pots asymmetrically (Peterson 1997, 190). The raised dots on this work’s surface compose an organically even design, yet any pattern of application is difficult to find. This apparent symmetry, along with the impossibly thin-walled asymmetry of the pot itself, is illustrative of Stevens’ artistry that places her work apart from Native pottery for tourist consumption. Potters in the Southwest have used clay infused with mica, a shiny mineral, since 200 A.D. (Anderson 1999, 5). This durable clay is suitable for cooking on a flame. The effective functionality of micaceous pottery caused its slow transition into the art world, and it continues to exist in utilitarian form today. Inspired by the effect of micaceous clay, Stevens made this piece with white clay, likely found in New Mexico, where she resides, and washed it with a micaceous slip (Peterson 1997, 191). This technique creates a subtle glittering effect and allows for greater emphasis on “line, form and shadow” (Schaaf 1969). Utilization of earthen material is evident, yet any heaviness melts into delicate form and detail. In many ways, Stevens has taken tradition and transformed it to function as contemporary art.